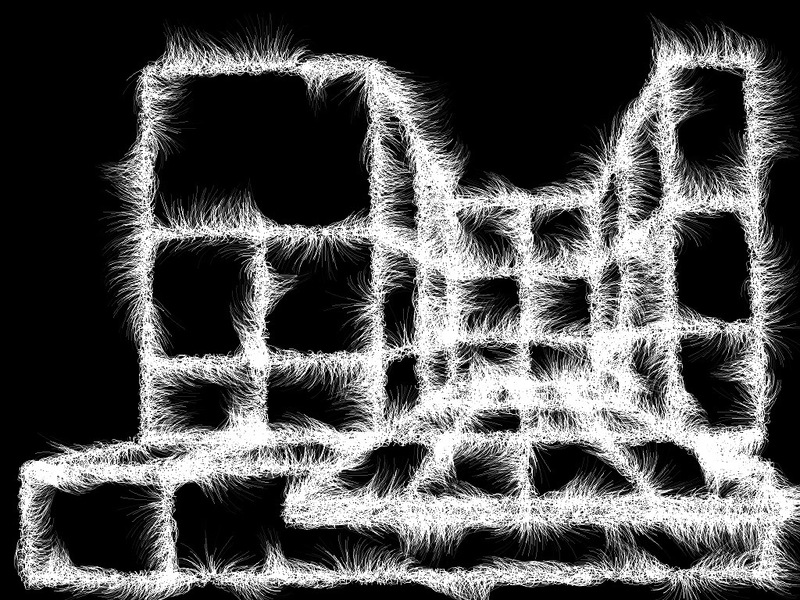 It just seems that I’ll never be finished with particles. Here are some snapshots of my latest iteration, intended to be used in our new show in-the-making, “CRISIS”. Hopefully we’ll be able to present a short show teaser at the Mapping Festival, on May 12th. I was just stuck in the train from Geneva to Paris, due to bad weather conditions. Hopefully I had my laptop and a fully charged battery. So I took some time to modify ParticleWarfare QC plugin, add a few new options. – It now takes a XYZ structure as input, so you can pipe a Mesh Vertices structure directly into the plugin. 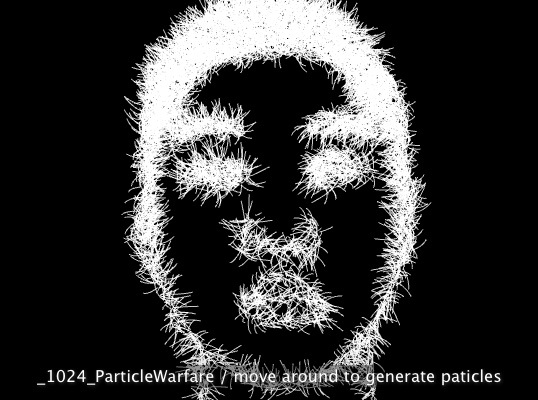 Mesh emitting particles. Yeah, that’s cool. – Added a Noise Multiplier option, for more subtle effects. – Tweaked a few other parameters and added a Depth Testing option. Still not bug free, so I wouldn’t recommend having 2 instances of the patch in the same graph. Sample files included. download from the box. Finally, the beta is out. Just on time for the weekend. This will definetly mark a pause in the plugin storm emitted from this blog, as I’d rather focus on producing content now. 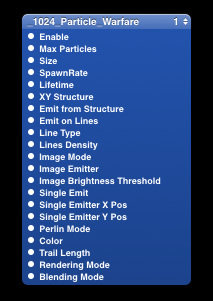 This plugin obviously features, among particle emission, lots of bugs too. Sample files are included. 10.5/10.6 Intel. Download from the box. No blabla or description, try it, eventually drop a comment, I’ll be happy. If you do kewl things with it, send us a picture or a video. For those of you in Paris the 2nd of October 2010, there will be a particle-emitting scaffolding structure on the Saint Louis bridge. See you there. Or not. I finally decided to get rid of the CINDER dependency (except cinder::Vector class, because it was really handy…) since the compiled plugin (codename:: ParticleWarfare) was way to big: from 4+MB, the final plug went to only … 100KB. Quite an improvement, for the same functionalities, less the compilation fighting. (Sorry about that… on the other hand, I learned a lot reading CINDER framework’sources, so well written, thanks again for this, you guys just rock the scene !). Lots of optimizations, esp. after having bought the bible by Stroustrup., which weights more than my Macbook ! This is not the type of book to bring on holidays. Still a couple of bug to remove before a proper release …. and a proper installation (in Paris on the 2nd of October, for those around). 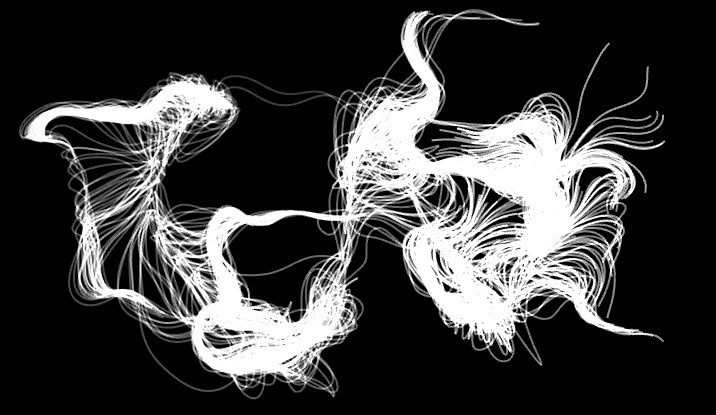 I’ve been working this week at a new particle engine for QC, featuring EmitterStructure input, Image input and Line based emission. The plugin will certainly be in use at 3 major shows we’ll be having this autumn. 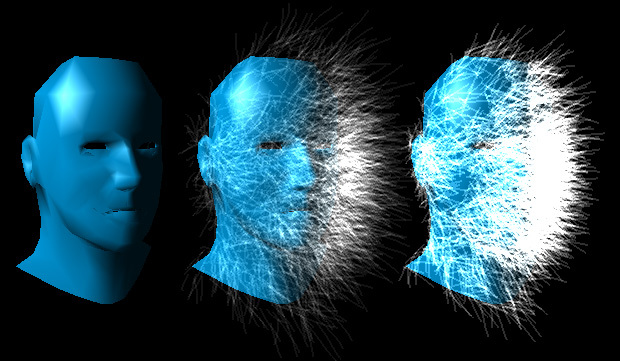 It currently also allows to grow hair-like trailing particles. As Salvador Dali said: ” Architecture has to be soft and hairy”. so I quickly fused it with my on-going Cinder-based particles plugin. 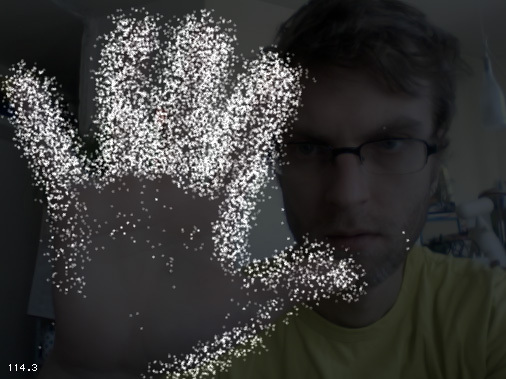 Now the plugin can emit particles based on some image’brightness (using motion detection). Here’s a snap, and hopefully a release soon.